a chronological record of significant past events that relate to a particular subject, place or organization. of extremely high or valuable quality. As everyone knows and understands, history… details both the good and the not so good. It draws no conclusions but rather simply records the facts. The term excellence has been used ad-infinitum by companies, in advertising and by individuals to the point where its credibility is oft-times undervalued. This story will take a look at the relationship between these two words and one of western North America’s premier on-road and off-road specialty trailer manufacturing companies. 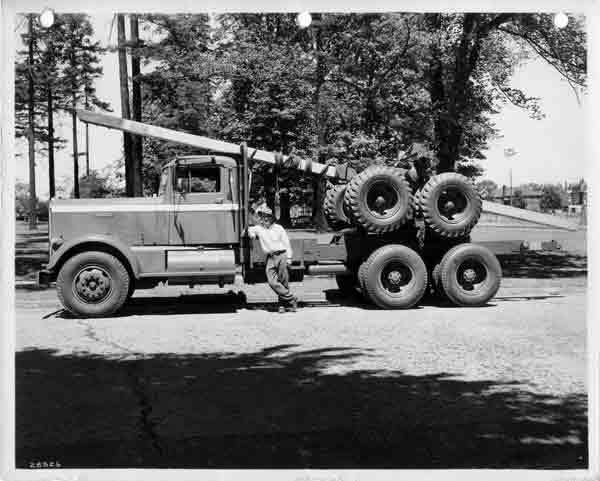 History records that in 1944, shortly before the end of World War II and just when North America was starting to look to a brighter future, the Van Raden family of Portland, Oregon began to design and manufacture specialty forestry and logging truck trailers. Their goal… to establish and maintain a new bench-mark of excellence in innovation, design, manufacturing and customer service that far exceeded anything that had been previously attempted. Although the start-up was small and humble… they succeeded. The young company grew quickly to become the most sought after specialty trailer by both truckers and loggers up and down the west coast of North America. 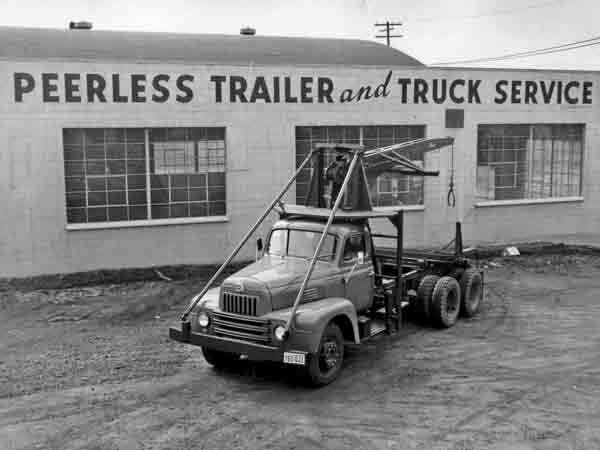 For the next three decades, Peerless Trailers, this family-run business, maintained a position of prominence in the industry. By 1972 the customer demand was such and in an effort to maintain the already well established level of excellence the Van Raden family purchased Page & Page USA and merged it with the Peerless business family. Along with this consolidation came a minor company name change to Peerless-Page Inc.
Just two short year later, Peerless-Page established a design and manufacturing presence in western Canada under the Page & Page Canada banner. Market share was gained and the fledgling facilities in Penticton, British Columbia, grew exponentially. At its peak, the 70,000 square foot plant located on 10 acres in the sunny Okanagan housed the work efforts of upwards to 200 people including up to 20 design engineers. In the early 1990’s, the company dropped the Page name from its brand and became known simply as Peerless. The Van Raden family eventually sold the business and following several short-term owners it was purchased by a major USA-based farm, forestry and construction equipment manufacturer. This company in turn sold the Peerless brand and manufacturing facilities to an Alberta based oil-field specialty equipment manufacturer. This latest purchase added the Scona USA brand of oil field trailers to the Peerless roster. Along with these ownership changes came the expected re-working of the company’s business plan. Although many of these business plan changes worked, there were still a number of potholes-in-the-road for the Peerless brand. That early established Van Raden family bench-mark of excellence in design, manufacturing and customer service suffered a few hard knocks. To paraphrase the lyrics of a popular Joe Walsh song… It’s hard to keep a good company down…. In 2014 the Peerless brand, facilities and intellectual property was purchased by Saint-Georges, Quebec based, Manac Inc., one of North America’s premier specialty on-road/off-road haul trailer manufacturers. Manac was founded in 1966 by Marcel Dutil and the company was based on many of the same forthright business principles that the Van Raden family used when they established the Peerless company over two decades earlier. Finally, after a bevy of owners, this Manac-Peerless business relationship embraced many similar successful company values. Peerless (www.peerless.ca) and Manac (www.manac.ca) are market leaders in the design and manufacture of customer-specific chassis and trailer solutions.